President Obama planned to use a speech at MacDill Air Force Base in Tampa on Dec. 6, 2016, to assess his role in fighting terrorism, taking credit for withdrawing troops from Iraq and Afghanistan while acknowledging the challenges of the Islamic State. Mattis on plane to home of Ft Bragg w/Trump while Obama speaking in Tampa at home of Special Operations Command & CENTCOM, which Mattis led. 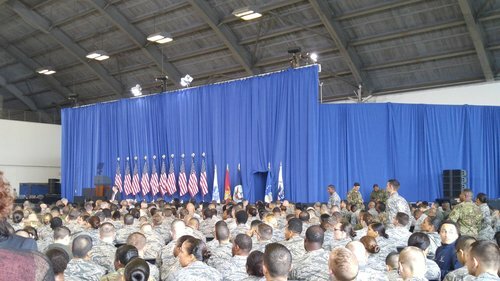 President Obama took the stage at the hangar at MacDill Air Force Base at 3:57p to loud applause after a service member led the audience in the National Anthem. Obama noted he will be the first president to leave office having served "two full terms during a time of war." "We are and will remain the strongest fighting force the world has ever known." Obama notes that even as the US fights, allies must join as well. Obama says al-Qaeda is "a shadow of its former self," and noted — to loud applause — that Osama bin Laden is dead. "Today, there are less than 10,000 troops in Afghanistan," Obama says, noting the situation in Afghanistan still is tough." The threat of terror metastasized, Obama says, pointing to "ISIL, the successor to al-Qaeda in Iraq." Of what came next: "We conditioned our help on the emergence of a new Iraqi government," Obama says, noting the coalition of forces joining us. 16,000 airstrikes. ISIL has lost half its territory," Obama says, and recruitment is down, commanders are diminished, and "local populations are turning against them." Obama comments on Mosul and Syria efforts, saying, "The bottom line is we are breaking the back of ISIL." Obama puts the cost of the fight at $10 billion over two years. "We've suffered terrible attacks," Obama says of US and Europe. "A recent study shows the ISIL's propaganda has been cut in half." This is your work," Obama says. "Over last 8 years, no foreign terrorist organization has successfully planned and executed an attack on our homeland." "To say that we have made progress is not to say the job is done." "The most deadly attacks in the homeland ... have been carried out by home-grown and largely isolated individuals radicalized online," pointing to San Bernardino, Fort Hood, Orlando. Obama says these wars will be different in terms of success than wars with nations. "Rather than offer false promises," Obama says, including "fencing ourselves off" from the world, Obama says he is laying out a different possibility. "Today's terrorists can kill innocent people, but they do not pose an existential threat to our nation. ... That does their job for them." "Overreach" is not the answer, Obama says. "Upholding our values and adhering to the rule of law is not a weakness, it is our greatest strength. ... "I must protect our people, but I also took an oath to defend the Constitution." "We prohibited torture ... including waterboarding," Obama says. "We can get these terrorists and stay true to who we are," noting successful use of the US legal system in terrorism-related prosecutions. "It is past time to shut down the detention facility at Guantanamo. 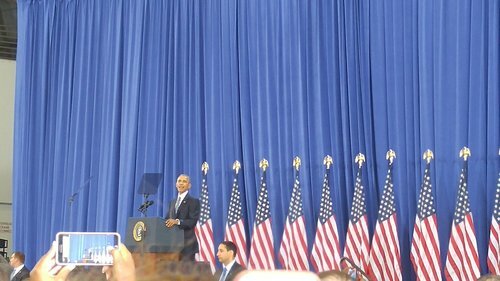 ... That's not strength," Obama says of the "politics of fear" that has kept Congress from ending detention at Guantanamo. Obama says that drones have been used to protect people. Of drone standards he put in place, Obama says there must be "near certainty" that civilians will not be killed. "The actions we've taken have saved lives — at home and abroad," but US must make sure the actions don't alienate people abroad. Obama highlights transparency efforts, including Monday's "legal and policy transparency report" referenced in out-of-town pool report #4. "I had no gray hair 15 years ago," Obama says of the longstanding Sept. 2001 Authorization for Use of Military Force, criticizing Congress for not updating it. "Permanently authorized war" is "dangerous" to US democracy, Obama says. 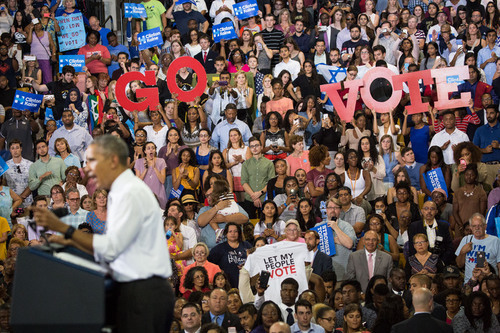 Congress must "make clear where they stand," Obama says to loud applause. "A dollar spent on development" is more valuable than "a dollar spent on war," Obama says. "We have to defend our civil liberties that define us." Oversight in intelligence-gather has increased, Obama says. Not "indiscriminately" reading emails, only "targeted" against those who would do harm. "Protecting liberty is something we do for all Americans, not just some." 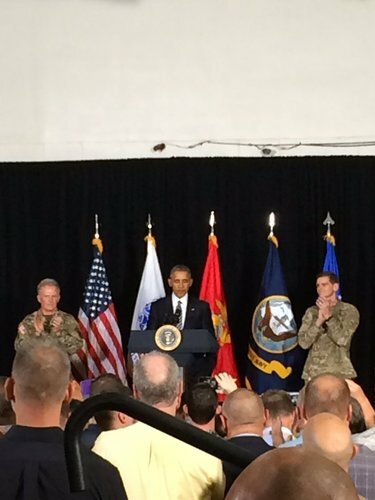 Obama notes Muslims serving in American military, saying that the war against terror cannot be a war against Islam. Obama says the US is a nation that protects "the universal right to speak your mind, and protest against authority," a country where one "can criticize a president, without retribution." After World War II, Obama highlights putting Nazis on trial — a nod to the respect for the rule of law. Obama highlights efforts since to create an "international order" to "protect our own freedom." "We are a nation, that at our best, has been defined by hope and not fear." Obama concludes by saying that it has been the honor of his life to serve as the commander-in-chief. Obama calls to remember what our flag stands for. Right makes might, not the other way around. Noting that the scoreboard in the gym at MacDill Air Force Base "coincidentally" happened to show a score of 44 - 44, President Obama told told the crowd of service members and more in the base's basketball gym, "I have been consistently in awe of your performance." Obama gave a separate shout out to each of the service branches - leading to raucous applause and shouts - as well as civilian employees, and military families. 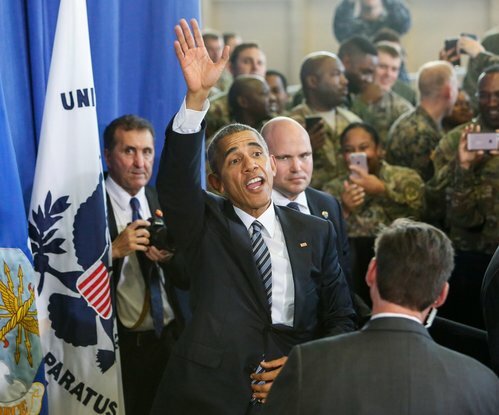 "The main thing I want to do is just shake your hands," Obama said, noting the 75th anniversary of the base and adding that the "men and women of this base have always stepped up when we needed them." 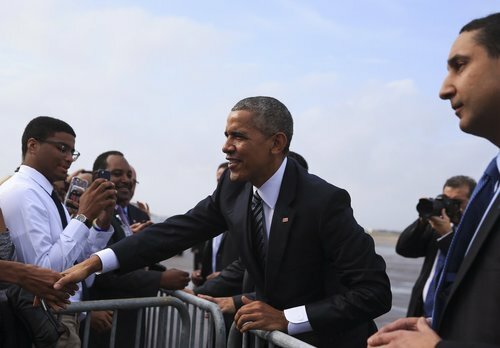 Before shaking hands with attendees, Obama added: "It has been the privilege and honor of a lifetime to be your commander-in-chief." 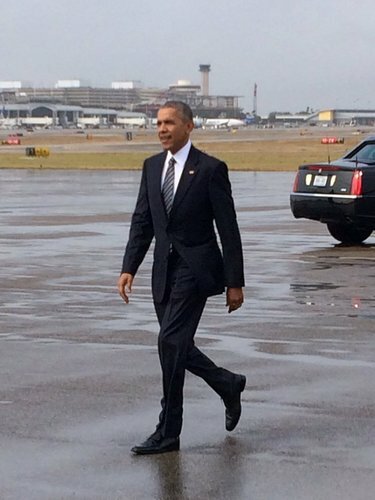 Obama and the motorcade departed for the speech location at 3:47p. Motorcade arrived at the hangar for Obama's speech at 3:53p. 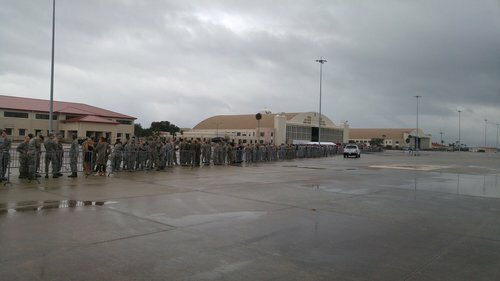 "Upon arriving at MacDill Air Force Base, the President participated in a meeting with approximately 100 leaders and members of the base community, including Special Operators. The President sought the session to extend his personal gratitude to these brave Americans, some of whom cannot receive public recognition for their feats on behalf of the country. He expressed his appreciation for the tasks they have undertaken, many at his direction, to safeguard the American people. The meeting consisted of briefings, discussion with the President, and an opportunity for the President to shake hands with those who participated." President expected to arrive at Macdill shortly. 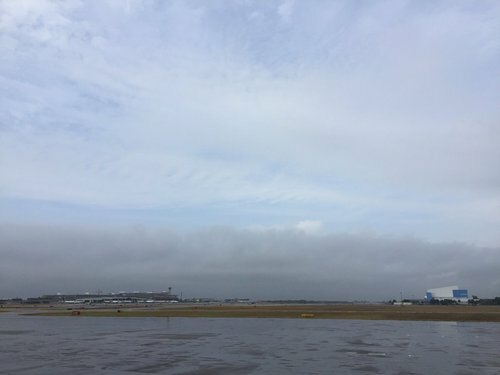 Air Force One landed at 1:45p at Tampa International Airport. It is a balmy 76 degrees and overcast. 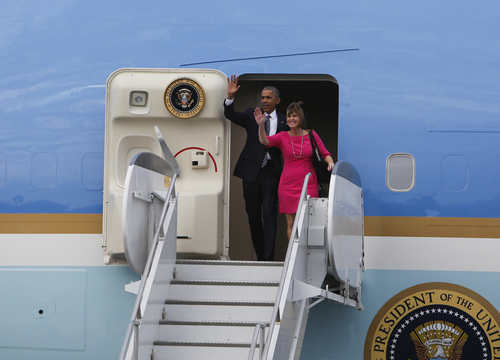 President Obama exited the aircraft at 1:54p, with Rep. Kathy Castor (D), who represents the Tampa Bay area, at his side. 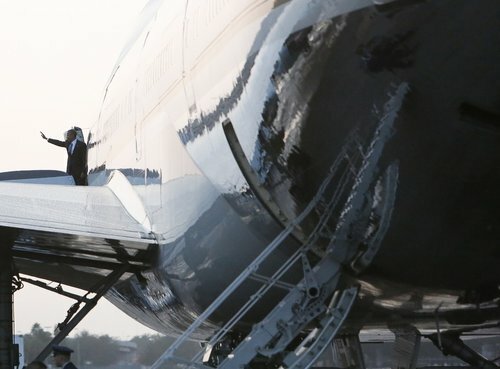 The president and Castor were greeted by Bob Buckhorn, mayor of Tampa (D), and Rick Kriseman, mayor of St. Petersburg (D), on the tarmac. 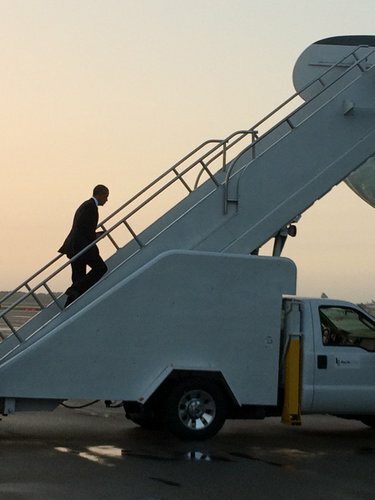 President Obama called Italian President Matteo Renzi on the flight, White House press secretary Josh Earnest said. 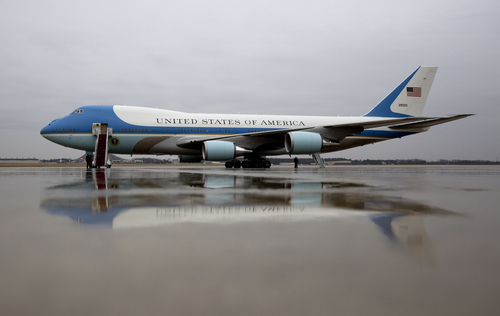 As to President-elect Donald Trump's tweet about the next Air Force One plans, White House press secretary Josh Earnest said, "I'd refer to my colleagues at the Department of Defense for the particulars of the procurement contract. Some on the statistics that have been, uh, cited, shall we say, don't appear to reflect the nature of the financial agreement between Boeing and the Dep't of Defense." Secret service is here, Bob Buckhorn greeting servicemen. 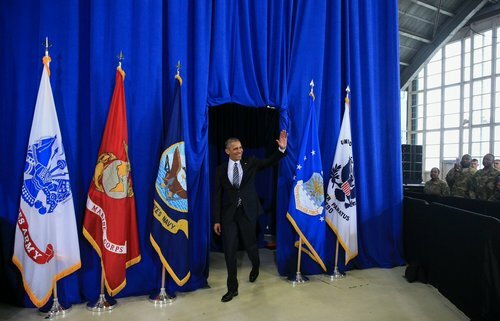 Tampa Bay TimesWASHINGTON - President Obama will use speech in Tampa today to assess his role in fighting terrorism, taking credit for withdrawing troops from Iraq and Afghanistan while acknowledging the challenges of the Islamic State.